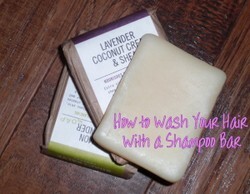 Curious about shampoo bars, but not sure how to use them? Have you used them in the past and the results were less than stellar? Learn how to use shampoo bars using my easy method. A few years ago, I wanted to eliminate chemicals I was being exposed to in my daily life, especially my hair care products. In researching what my alternatives were, it seemed as if every natural hair care blog I read was telling the world how great natural shampoo bars were. I was trying to become more earth friendly, and after reading glowing reviews, I quickly ordered a couple bars. I was so excited the day I got them in the mail. I opened one up, used it, and...........I hated it. It made my hair feel yucky. I looked like a bush. I couldn't even get a comb through my hair. I threw my entire order away and vowed I'd never use a shampoo bar again. I recently had to go back to shampoo bars, and guess what? I love them. I'll never go back to commercial shampoos again. What changed? I learned there's right way to use them. You'll try anything when you're in the midst of a hair crisis. Even though shampoo bars were out, I still continued my chemical-free journey to find green hair products that worked. After learning how damaging sulfates were to hair, especially curly hair, I did switch to a sulfate-free shampoo. I was a pretty happy camper. For a while. Suddenly one day out of the blue, it seemed my scalp itched constantly. I thought my head was itching because it was dirty, so I washed it. It soon got to the point where I was washing my hair every other day to try relieve the itch. Nothing worked, and I kept scratching. I thought maybe I was allergic to my shampoo, so I switched brands. Twice. I still itched. I finally realized I needed to try something as natural as possible on my hair to relieve this stupid itching. In my desperation, I turned to organic shampoo bars. This time, I researched the different methods that others were using and posting about in the blogosphere. I finally realized all those people couldn't be wrong, it had to be me. Well, it turns out it was me. To have success with solid shampoo, there's a certain method you need to follow. Honestly, your hair is going to feel nasty for a while. Hang on. It does get better. When I first switched to natural shampoo, I thought the sky was going to part, the hair gods were going to shine down on me, and I would finally have shiny, bouncy ringlets. The best part? I'd never know frizz again. What I got was hair that looked like two-week old bedhead. The reason my hair looked so bad was because it was going through withdrawal. Nearly all commercial shampoos and conditioners contain an ingredient called sulfate in one form or another. This nasty detergent is so harsh, it strips your hair of not only dirt, but natural oils as well. When you use SLS shampoos on a regular basis, your scalp is constantly producing oil to replace what is being stripped away. When you make the switch to shampoo bars, your scalp is still producing the excessive oil it was when you were shampooing with commercial products. Your scalp doesn't realize it can put the brakes on oil production at first. Typically it takes about two weeks of washing with solid shampoo for your hair and scalp to realize, "hey, we can take it easy now!" That transition period is why you think the shampoo is worthless. I know your hair will not be pretty. I know your hair will feel like you poured a bottle of vegetable oil on it. It's tough, but if you wait out the transition period, you'll be rewarded with soft, healthy, great-looking hair. Conditioners Have Sulfates, Too: What to Do? Don't send your hair and scalp mixed signals! It was one thing to switch to solid shampoo bars. 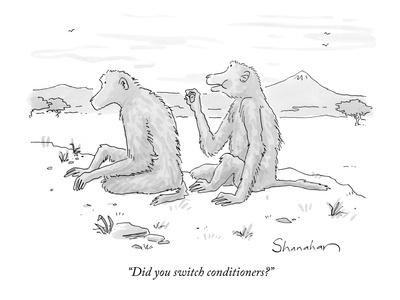 It was another thing altogether to give up conditioner. After washing, even with the bars, my hair would be a tangled mess. Couple that with curly hair, and my results were disastrous. I read the ingredients in one of my favorite conditioners. Alas, it contained a form of sulfate. I had switched shampoos to get away from harsh ingredients, but I was ignorantly damaging my hair by applying a sulfate-containing conditioner. No wonder my hair was upset with me. I was sending it mixed signals. I found a sulfate-free conditioner and gave it a try. It did a good job, but I wondered if I could go further. I wanted as natural a hair care routine as possible. After using a sulfate-free conditioner for about two months, I finally worked up enough nerve to try an ACV rinse. I mixed about 1/2 cup vinegar with water in a quart jar, held my breath, and poured in on my hair. As soon as it ran down my hair, I could feel the texture of my hair change. My scalp was still irritated a bit at that time, but the vinegar soothed it immediately. During the comb-out process, I had another surprise. Even with my old conditioners, it still took me at least 20 minutes to comb through the tangles. My first comb through after using the vinegar was five minutes. Afterward I did apply my homemade hair gel and my hair felt and looked wonderful. However, I became even braver (okay, cocky) after a few weeks because my hair felt so great. I stopped using all of my styling products and haven't regretted it since. Can Shampoo Bars Eliminate the Need for Gels and Mousses? From my own experience, yes, they can. It's now been a little over a month and I haven't needed any of my old gels, mousses, creams, or sprays to tame my frizz or define my curls. My hair is soft and curly. It's doing so well, nobody has been able to tell I've stopped using my curly hair products. My experience may be atypical, but it's definitely worth giving it a try to see if it works for you. After all, if you can eliminate one more man made product from your beauty routine, I think that's a great thing. I know the idea of using solid shampoo can be daunting to some people. When I used them the first time, it was a mystery to me as to how to even use it to lather my hair. So for those of us who are more visual learners, I've made a video showing you just how I use shampoo bars and do the ACV rinse. Hopefully it takes the guesswork out of using shampoo bars and the apple cider vinegar rinse, and you'll be confident you're using them the right way. Will You be Giving Shampoo Bars a Try? Yes, I'm really curious about them. No, they seem like too much work. An excellent natural mineral rich shampoo for both scalp and hair. These plastic bottles make great applicators for vinegar hair rinses. Use them to squirt through even the thickest of hair. Popular professional comb styles in an elegant tortoise finish. Come in several different styles. Which Shampoo Bar is Best for my Hair Type? Unfortunately, shampoo bars aren't like commercial shampoos in the fact that they're made for a specific hair type. There isn't a special bar for color treated hair, damaged hair, oily hair, et cetera. To find the right bar for your hair, you're just going to have to try them out. This may sound like a waste of money, but it doesn't have to be. Shampoo bars I have bought in the past that my hair didn't care for have become my favorite body soap in the tub. I have 3b/3c hair, and I've found that my hair responds best to shampoos made from coconut oil. For some reason, my hair just doesn't care for large amounts of shea or cocoa butter. Still, even though there is a small element of trial and error involved when it comes to choosing the right solid shampoo for you, shampoo bars are still the healthiest, chemical-free way to cleanse your hair. This is such useful advice about avoiding chemicals. I'm putting this on one of my natural health boards. Thank you for reading! I don't think many people are using them yet. I have never heard of shampoo bars before, sounds like a nice choice.